This is fantastic! Thank you so much Robin. You are the best and we appreciate you so much at the Salvation Army always helping us get the word out about programs and fundraisers through the Oklahoma Senior Journal • Magazine • Radio & App! I give The Oklahoma Senior Journal out all of the time! You make such an impact in the senior resource world! Thanks for what you do…..you make my job so much easier! And besides, you’re just so fun!!!! The Oklahoma Senior Journal E-newsletter has such great and really neat information each week,,,, Thank You for providing these to the public! I am so glad I signed up to receive the OSJ e-newsletter off the OSJ website. THANKS for all you do for the Senior Community… I had to just say; THANKS ! This is Rebecca Brown you were so kind to send me all the bingo hall information here in OKC. I so appreciate you texting those 10 locations and their hours to me. My son is 51 and disabled so we both are part of the 50-Plus Population. We moved to OKC from Topeka Kansas and with research we picked Oklahoma City as our finial home. We really don’t get out and about very much but we both love to play bingo. My son is totally disabled he walks with some difficulty and has diabetes but other than that he’s very bright and wants to stay involved in life. Anyway we have some fun places to go now and play Bingo because of you Robin being so kind to text us 10 Bingo Halls in our area of OKC! I want you to know that we both use The Oklahoma Senior Journal more then you can even imagine! I found the Oklahoma Senior Journal At our local library and all the services in your Magazine are literally life saving! We are living in The Village now in OKC but we will be moving soon to another property that will Service us better here in OKC. Robin I am very happy to have your Magazine, The Oklahoma Senior Journal helps guide my son and I with all these valuable services available in the pages of your Journal that are right here in OKC! Thank you so much … You are such a caring person besides being the Editor of the Oklahoma Senior Journal. My Husband has been gone for 21 years now and it is just my son and I now and we rely on your Magazine to help us … We seriously use it constantly! I just had to let you know how much We use the Oklahoma Senior Journal… It is used daily for both our needs. I am planning on using the Moving company in your Magazine soon and very soon! Please know – What you do for our 50-Plus Community is Wonderful and I needed you to know how grateful my Son and I are for the vital resources in the Oklahoma Senior Journal and for being so available to your Readers! I am very, very sorry to hear about the passing/loss of your father, Gordon Gunn. I got to know him well being in Greg your brother’s office is in 2003. What a great man! What a great family – You Have! The Oklahoma Senior Journal – WOW!!! Absolutely the best Publication Ever for the Fifty Plus and their Families!!! Thank you so much for promoting this program for the Salvation Army’s “Let’s Talk About It, Oklahoma” Book Club Program for Seniors! I will be sure to share it on Facebook too, like the Oklahoma Senior Journal Magazine, Radio & App has! You are so wonderful, Robin ! Thank you so much for everything that you and the Oklahoma Senior Journal Magazine, Radio & App are doing for Mercy Fitness Center. It is greatly appreciated! Have a great weekend! Thank you Robin for all of you and the Oklahoma Senior Journal • Magazine • Radio & App help! We appreciate everything you’re doing to help create awareness for Mercy Fitness Center in the community. For all of my OKC friends, stay safe and warm this snowy Friday. Thanks for sharing our Sunbeam Family Services photos and having us on The Rise & Thrive OSJ Radio Hour, Robin! We appreciate you So Much! I am very grateful for your generosity in granting a free interview to my boss, Kristin Hersom from the Pete White Maps 3 Senior Health & Wellness Center. We appreciate, people like you, who are willing to get the word out about our center and help us get more 50-Plus members. This would not be possible without your help at The Oklahoma Senior Journal Magazine, Radio & App…. Again, Thank You So Much!!! We love and appreciate you ! The Oklahoma Senior Journal • Magazine • Radio & App are such wonderful supporters of the Salvation Army! We Thank You Very Much for all the exposure you give us ! Awesome Robin, Thank You so much! We really appreciate all that you do for us and the Senior Community… We are Blessed to have you and the Oklahoma Senior Journal Magazine, Radio & Your App! Hello, Robin ~ Thank you so much for hosting Liz Banks and Dee Watts for OSJ Radio Hour! You are greatly appreciated! I hope you had a wonderful Thanksgiving, Robin. I love it, The In-Studio Radio photos of us! They turned out great! Would you mind either sending me the email or phone # for Your Radio Show Producer, Carissa? If the radio Show is ready Digitally, I would love to distribute it…thanks, Robin! And thanks so much for the lead to Joan Clarke with the Santa Market …I’m taking flyers to her today…!!! Please let me know if you get any response to the show…loved doing it with you…you’re a pro…! Yes, it was me! Your nieces are beautiful and sweet. They represented the Oklahoma Senior Journal Magazine, Radio & App Very Well at the Shawnee Senior Center Healthy Fair Event … You would have been proud! I did get the OSJ e-newsletter last week and WHAT an informative and great e-newsletter you have, I just loved it and look forward to seeing more! I will go share the OSJ Facebook post you did for our charity now! 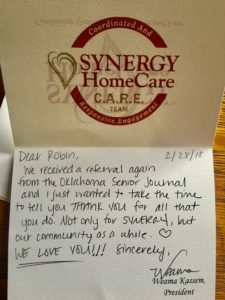 Thank You for all your help Robin, you have been awesome and The Oklahoma Senior Journal is a Fantastic resource for the 50-Plus and those they love! Thank you, Robin! We appreciate you and OK Senior Journal. There’s SOOOOO much good stuff in there! I keep one on my desk as a resource! I will definitely do that!!!! I have received several vendor calls because they saw it first on the Oklahoma Senior Journal Facebook or website or app page. Again We Love You and the Oklahoma Senior Journal Magazine!!! No surprise at all. Christina that is on our Centennial Team is awesome! Thanks for sharing this testimonial with us, Robin! You and the Oklahoma Senior Journal • Magazine • Radio & App are a top notch caring resource for senior, their families, loved ones and companies wanting to help and reach out to our Oklahoma 50-Plus Community! And we have only been marketing with the OSJ media package for a month & a half! Robin ~ Thanks so much for inviting us to REI. It’s a great networking opportunity and I met some wonderful women today. Thank You – Thank You & Thank You! Thank you, Robin, for putting our Shawnee health & wellness fair flyer and information up on your website, upfront big and bold. That was wonderful when I was cruising through your online magazine. You all do so many wonderful things at the Oklahoma Senior Journal!!! Thank you for doing all that you do!!!!! This is a great magazine that reaches tons of people. I’ve gotten five jobs from my ad, from being in the 25th Anniversary Issue and it has only been 6 weeks so anyone that doesn’t advertise in OSJ is missing out..! Thanks so much for visiting with me this morning, concerning the next step with my Mother’s care. Mary my wife told me weeks ago to call you but I just now got to a point I could breathe for a moment and look past today. Thanks again for your help! I am so grateful for your knowledge and willingness to help! Besides the Oklahoma Senior Journal Magazine, I also listen to the OSJ Radio Show on KZLS The Eagle on 1640AM on Saturdays at 9:05am and 10:05 am and you have such good programs on that are entertaining, educational and full of resources! Centennial Insurance Group Writes on The Oklahoma Senior Journal • Magazine • Radio • App Facebook Page ~ One of the Best Medicare Agent’s in the State; Christina Sibley tomorrow on the Rise & Thrive OSJ OSJ Radio Hour at 9:05AM KZLS The Eagle 1640AM with Host: Robin Gunn! Thank You for sharing a Email from a listener from my Show on the OSJ Radio Hour on 9/29/18…. That’s Great! He’s a nice guy. I’m going to help him as soon as he’s able to sign up for Medicare. He was the first person to call me from my ad in the Oklahoma Senior Journal…. I’ve had two new clients from my Oklahoma Senior Journal Ad in the 25th Anniversary Issue and it has only been out one month! The Oklahoma Senior Journal has been a fantastic investment for me and my Business. ~ Christina Sibley, Medicare Specialist with Centennial Insurance Group! This is Cheryl Hawkins friend of Robin Gunn’s mother. I wanted to acknowledge your heart for helping with the situations concerning the “Attack of the Bed Bugs” sounds like the title of a movie. I wish that’s all it was. Thank you, Robin for going out of your way to help with getting me in touch with the right people and it didn’t cost me a cent! And also helping my friend’s blind mother at Grace Living Center’s. Not only was she getting better help now because of you but others benefitted from the notice of the protective services for the elderly. I Thank You Robin Again and God Thanks You for your loving heart. Thank You so Much and I appreciate you and all that you do for seniors but I know you know that ! I appreciate you for your kind heart as well and a double Thank You so Much for the $100 for my retirement from the Salvation Army as the Senior Program Manager that’s absolutely above and beyond and I am going to do something for me! This is Great…We appreciate the exposure, That the Oklahoma Senior Journal is giving to Concordia Senior Living, 6th Annual Fundraiser Garage Sale. We will definitely keep in touch with you! You and the Oklahoma Senior Journal • Magazine • Radio & App are a wonderful friend to the Salvation Army and we want to maintain that relationship. And Thank You for the special prayers for our snuggle bug, Anna! I tried to like your ok senior journal on Facebook Page but I already had, so it unliked it??? I liked it again! Lol! I wanted to write a post on your Facebook page to say how great you are, how much I appreciate all that you do for our community, veterans and families but I couldn’t figure out how to do that! Anyway, I love your family as well … What a Beautiful Blessing You all are … A True Blessing! Thanks, Robin! It’s always a pleasure to work with you! “Well it’s already working, I just got a job from a lady who was reading at her Dr’s office the Newly release Oklahoma Senior Journal & saw my ad in OSJ……in the New 25th Anniversary Issue that just came out last week!!! ~ Signed Dale Wood of Honey Do’s By Dale / on Page 24 in the current issue of the Oklahoma Senior Journal LandMark 25th Anniversary Issue! I love the texture of the New 25th Anniversary Issue cover of the Oklahoma Senior Journal. Very high end, Robin! Nothing else out there like it. Robin ~ I am Super excited! Already out of the ones that were delivered yesterday. My clients love the Oklahoma Senior Journal!!! The magazines look PHENOMENAL! Soooo honored and grateful to be featured by your company!!!! How can I order more? I have MANY clients and I would love to bless all of them with one. Thank you so much again for having us all on the Rise & Thrive OSJ Radio Hour this week and letting me join this experienced amazing group! 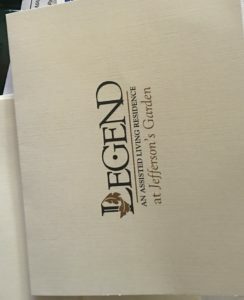 You all are AWESOME and it will be a fantastic opportunity for Legends Senior Living with Radio and the Legends Senior Living OSJ Magazine Pet Cover and two Page spread on Legends in the 25th Anniversary of the Oklahoma Senior Journal’s LandMark issue! We can not say enough good about how Robin Gunn and The Oklahoma Senior Journal • Magazine • Radio • App does for our business and the overwhelming Heart Robin has for our 50-Plus Community and their families! Yes, thank you, Robin, for sharing Feedback from one of the OSJ radio Listeners. It was a pleasure meeting you and all your very professional and personable staff with the OSJ Magazine & Radio Show!. Thanks for airing the ProCure Proton Therapy Radio Show on your Oklahoma Senior Journal Radio Hour. I just found out today that a friend of mine has Prostate cancer and I was able to use the information I got from listening to your radio program to help him on his journey. I’ve been wanting to contact you for a long time…I’ve been receiving your Oklahoma Senior Journal Weekly e-newsletter for quite a while…your work and dedication to your cause is extremely impressive. You have the repertoire and such experience with the 50-Plus! Thanks so much for the opportunity to partner with OSJ. We look forward to many more fun times ahead. Awe! That is such a sweet of a photo of all of us on The Rise & Thrive OSJ Radio Hour! 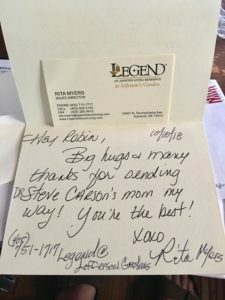 Thank you, Robin so much for the opportunity to share some amazing stories of love about our Senior residents at Legends ! I downloaded the The Oklahoma Senior Journal app today – It’s VERY GOOD!!! I Will forward how to down load the OSJ-App to my Legend’s team mates! Again, Today was a blast on the Rise and Thrive OSJ Radio Hour! It Makes me miss the days I was in radio. You and the a Oklahoma Senior Journal are awesome friends to Legend Senior Living Communities ! Big Hugs to your Mom and Dad from me … You and the Gunn’s are such a Beautiful Family! Thank You, Again – Robin ! Thank you for a wonderful and professionally hosted discussion on the Oklahoma Senior Journal Radio Show last week. I am looking forward to the ProCure Article coming out in the Oklahoma Senior Journal’s 25th Anniversary Issue! Thanks Robin! It was great for Kathleen and I to be on the OSJ Radio Hour last week! The show was so good and you made us both feel so comfortable! Robin, You are very much appreciated! You are the best on how you and the Oklahoma Senior Journal • Magazine, Radio & App – Support the Salvation Army the way you do! Thank you, Robin, SO much for the opportunity to talk about Hope Retreat Ranch on The Rise & Thrive OSJ Radio Hour! It scared the bejeebers out of me to go on the radio but you are so professional and so giving that you made me feel very comfortable. I truly admire you for all that you do for our community with the Oklahoma Senior Journal! An experience I’ll ALWAYS remember! Thank you so much for your recent consideration and publication of the press release I’ve shared with you. We are honestly blown away by your promotion and very grateful for your time, effort, and kindness. Along with what you and the Oklahoma Senior Journal Magazine, Radio & App mean to our community! Robin: I enjoyed getting acquainted with you and assisting the ProCure folks with their project on the OSJ Radio Hour. Thanks for everything! Thanks, Robin, I do try to check the OSJ app frequently but need to be better about going to the OSJ website or the OSJ FB page. Thanks as always for your help for us professionals and the Senior Community. Emma sent me the package for OSJ. I’m so excited about the way it turned out. I can’t wait to see it in print in the 25th Anniversary Issue of the Oklahoma Senior Journal! Thanks so much for the wonderful opportunity. That is absolutely perfect thank you for going above and beyond for me. You guys are awesome at the Oklahoma Senior Journal !!! Thank you Robin for everything!! Very appreciated!!! We really do appreciate what all you do for Seniors in our community and now for Crossings! I have used my Oklahoma Senior Journal… almost have use my copy to much … I need a new one! I Love – Love – Love the Oklahoma Senior Journal… I tell people all the time about the Oklahoma Senior Journal. When Can I get my new copy? Editors Note: We mailed out a new copy to Mrs. Greenwood ! Hi Robin, This is Valorie Martin, Programs Coordinator at the Shawnee Senior Center. Thank you so much posting our event on your events calendar and now with this Facebook post, really appreciate all you do! Thank You for keeping us stocked with the Oklahoma Senior Journal… We all love reading it and having all the resources right at our fingertips! Hello Editor of the Oklahoma Senior Journal ~ I picked up a free copy at the 2nd Annual 50-Plus Better Living Expo yesterday and I would like to get another copy. I want to give this copy to someone in the senior living place where I live. This is the best Magazine I have ever seen for the 50-Plus!! Thanks, Robin! I saw it when it popped up on my FB yesterday. We appreciate all your support you give the Arthritis Foundation! Thank you for letting me know, Robin! I love it! 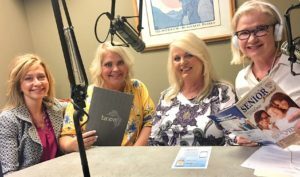 Thank you, again for all you do for our 50-Plus population, through the Oklahoma Senior Journal and for inviting me on The Rise & Thrive OSJ Radio show. You are so generous and it is making a great difference! 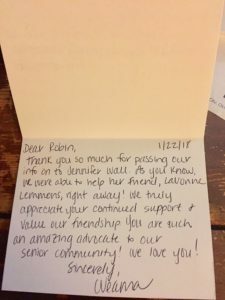 Robin – You Are Awesome! Thank You For The OSJ Magazine & Radio for the support of CareTrak!!! Thank you so much, Robin! I deeply appreciate you and the Oklahoma Senior Journal’s constant attention to The Salvation Army and our programs! Denise and I would like to upgrade to a half page color ad in the Silver Anniversary LandMark 25th Anniversary Issue of the Oklahoma Senior Journal this year! Thank you for SO many years of being such a great advocate for Seniors in our community!!!! Hi Robin, good to see you here! I have followed the OSJ facebook page for a while! I like what you provide to the community! Thank You Oklahoma Senior Journal for spreading the word about the Salvation Army Senior Fair and for being a Sponsor to the event. We appreciate you so much at the Salvation Army and you do so much for our Seniors in Oklahoma!!! Appreciate You Robin Gunn and the Oklahoma Senior Journal!! Amazing, as always! Thank you, Robin! You Are Awesome Thank You OSJ Magazine & Radio and Robin!!! I have submitted your email to our Ownership for review and discovery as to what they would like to do in the Oklahoma Senior Journal 25th Anniversary issue. Hello Robin, I hope you had a great weekend! I listen to your Radio show on Saturday. Very good information!! I like having the OSJ-app on my phone. As we look to advertising with the Oklahoma Senior Journal 25th Anniversary Issue in July 2018, can you give me some deadlines for when we need to have our Ad to you? Dana M. Nursick Marketing Benchmark Financial Group, Inc. Thank you, Robin! It was indeed a lot of fun being on The Rise & Thrive OSJ Radio Hour and I appreciate any and all opportunities to share the word about Adult Day programs. We will share with all of our folks! Thanks for being such a great (and beautifully enthusiastic) champion for Oklahoma seniors. That is amazing on all the OSJ Facebook posts for Sunbeam Family Services and they get 100’s and 100’s of views! Thank you for your support, Robin at the Oklahoma Senior Journal !! You guys did a wonderful job! I enjoyed listening to the Sunbeam/CareTrak Show on the Rise & Thrive OSJ Radio Hour. Thank you! Hello, Robin ~ Thank you so much for having me on your Radio Show. Thank you for this great email! I heard the OSJ Radio Show went very well with Dr. Schrader and I’m glad you enjoyed it and he thought it went well! I also heard Casey might change careers and start doing voice-overs for commercials! Haha! We will make sure and “like” and “share” the Oklahoma Senior Journal Facebook page from our Crossway Medical Clinic Facebook Page, as well as our personal, and encourage our family and friends to do the same! I’m looking forward to listening to the OSJ Radio Hour with Dr. Schrader as the featured guest! Robin – This is really great, thank you for sharing the data you have with Valir PACE and I am so glad to hear your mother is considering joining Valir PACE! Hey, Robin – That is exciting! I look forward to talking about the Rise & Thrive OSJ Radio Show in today’s meeting at Valir PACE !! woohoo! I hope you are doing well! I wanted to see if I can get some copies of the Senior Journal for our offices. We have offices in OKC and Norman. Let me know if we can meet up – or you can drop them by my office in downtown OKC- 531 Couch Drive (if you are in the area). Would love to see you! Plus the Oklahoma Senior Journal is the most resourceful Information source I have ever seen for Oklahoma families! It is literally quite frankly a wealth of information! I just love your energy and enthusiasm, Robin you make such a nice day brightener! Thank You for having Mary Brinkley with LeadingAge Oklahoma and Myself on the Rise & Thrive OSJ Radio Hour! It was such a fun experience and we shared such great information out to the listening audience! Have a wonderful weekend and Thank You! Thanks, Robin. That is very generous! We appreciate you and the Oklahoma Senior Journal and Radio support and dedication to helping us make VillagesOKC a reality. This is absolutely fabulous!!! Thank you so much for your support, energy and dedication to making VillagesOKC a reality for everyone!! I can’t thank you enough for the work you do to help seniors and to build much-needed community and support. The resources I found in the Oklahoma Senior Journal are fantastic, and go a long way towards helping our aging realize that they are not alone. As a librarian, I’ve staked my career in helping empower people with knowledge, and so I’m grateful to find others who share that vision. I’d love to hear about any projects you’re working on for seniors, or any subject matter pertaining to seniors that you feel is underserved! Robin – Thank You for Helping us get the Word out on Diabetes Education. You and the Oklahoma Senior Journal make the community aware of resources and we are grateful for your Willingness to help! Robin ~ I wanted to tell you…Thanks for coming to my office to visit about the Oklahoma Senior Journal with me. It was great to meet the Editor behind this vital publication for the 50-Plus. I have shared the information for Marketing in the OSJ Magazine to my Client’s Credit Union. Thank You so much for all you do for Alzheimer’s Awareness and the Santa’s Market! We Truly CAN NOT DO THIS WITHOUT THE HELP of Wonderful people like you and the Oklahoma Senior Journal Magazine and the Oklahoma Senior Journal Radio and the OSJ-App, E-Newsletter & OSJ Facebook posts!!! Thank You too for coming and stuffing the 1000 Shopping bags and for providing us with 1000 Oklahoma Senior Journals for our Santa Market Take Away Bags that were all gone by high noon this year!!! Special Thank You for Tirelessly PROMOTING us on your Talk Radio Show; The Rise & Thrive OSJ Radio Hour on KZLS The Eagle 1640AM on Saturday morning’s at 9:05am and Promoting us on the OSJ-app, OSJ weekly E-Newsletter, OSJ Facebook page and the OSJ Website Calendar of Events. WOW! Robin and for HELPING US RAISE AWARENESS and FUNDS for the CURE to END ALZHEIMER’S in our lifetimes. I know how near and dear your Father is to you and your whole involved family with his diagnosis in 2004. We do this for him, my husband and for all of them in our City! 1 in 5 diagnoses a day. You have without a doubt HELPED US to extreme measures even handing out our postcards and flyers all over town to the tune of over 1500 … WHO DOES THAT ?!?!? I am here to tell you ROBIN GUNN does that, The Editor/Publisher/On-Air Host of the Oklahoma Senior Journal Right here in our City. Robin, you are nothing but a pure gift to us … Never taking one dime of money to do what you have done for us here at Santa’s Market each year!!! You have been helping us for the last SIX YEARS and you only work harder for us each year! You are one of the Main Big Reasons That In 2017 Santa’s Market Hit our highest goal ever on raising funds for the Alzheimer’s Association!!! We LOVE You Robin (You Truly Walk The Walk That You Talk!) and We Appreciate ALL YOU DO for us at Santa’s Market and The Alzheimer’s Association!Love & Blessings on You and The Oklahoma Senior Journal Magazine/Radio/App/E-News, Website & Facebook Page! Editor Note: This is one of the passions of giving back that the Editor/Publisher & On-Air Host Robin R. Gunn does in the OKC Community! 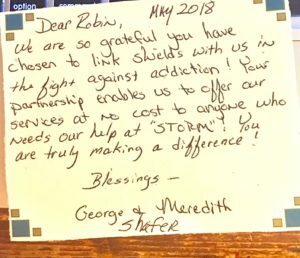 Robin…I want to take just a moment and tell you, I Love You Thank you for always moving and shaking and sharing for US at Synergy Home Care! You are truly a gem I’m glad we’re friends and we work with you at the Oklahoma Senior Journal Magazine and Radio Show! You are the best marketing firm for Businesses with our 50-Plus population in our State! Thank you again for all you do for us, at Groomer A Go Go Pet Salon & Market and ALL your hard work you put into marketing for us!! The Oklahoma Senior Journal and it’s 16 Page PET Section and your very informative radio show on KZLS 1640AM The Eagle every Saturday morning at 9:05am for the 50-Plus works harder for their clients in making sure their services are seen, known & represented to the Oklahoma public with vibrant gusto … It truly is inspiring & appreciated deeply … You are a Media Whirlwind for businesses!!! THANK YOU so much, Robin! And I am so glad Charlotte Carey was able to help! 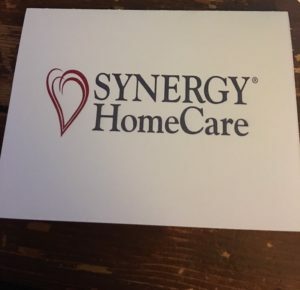 We appreciate you and all the support you give us here at Synergy Home Care in Norman, OKC & Edmond! Your kind words and recommendations out in the community sure do mean a lot. ~ Abbey Trammell; Social Media Manager at Synergy Home Care. Editor’s Note: The Editor & On Air Host Robin Gunn was called on a Sunday night at 6:30pm from a reader/listener of the Oklahoma Senior Journal Magazine/Radio … Needing a caregiver for an in-home Dementia patient because her daughter was hospitalized with a 9-1-1 situation and their family needed someone within/home care within the hour… Synergy Home Care was there! The OSJ Magazine Editor & On-Air Host is Called by readers and listeners to our Radio Show “ALL THE TIME” for our pre-vetted clients in the OSJ Magazine or Radio Shows … That’s right we meet, interview & get to know who is in the pages of the OSJ Magazine as well as The Rise & Thrive OSJ Radio Hour, on KZLS The Eagle 1640AM every Saturday morning at 9:05am!!! We ALWAYS go the extra mile no matter what time, day or hour it is! Hello, Robin Gunn Editor of the Oklahoma Senior Journal and OSJ Radio Hour ~ Thank you for all the support you give to the Grandparents Raising Grandchildren Program. It is because of supporters like OSJ that we are reaching so many of these grandparents. I enjoyed meeting with you and the resources you provided were priceless. Dear Robin Gunn ~ I Listened to the Oklahoma Senior Journal radio show yesterday with your Guest Marilyn Olson the Executive Director of VillagesOKC-NW. I believe the Line was, It is a PLAN … NOT a Place! It was a Very very informative show, I learned more from that show than in all the meetings, I attended about VillagesOKC. The questions you ask were exactly what I was thinking I would have to ask! It was awesome and it answered a lot of my questions! Good Job – I am so glad you have such a informative Radio Show! I also Love the Oklahoma Senior Journal Magazine… I get it for myself (I am 52) and for my Mother. We are so Blessed to have such a caring person in our city that brings us such vital information to our Radio airwaves and right inside my house with the Oklahoma Senior Journal Magazine! Thank You ! Editor’s Note: Please listen to the Rise & Thrive OSJ Radio Hour every Saturday Morning at 9:05am on KZLS The Eagle 1640AM and if you miss an OSJ Radio Show … Go to the OSJ Magazine website (okseniorjournal.com) to listen in on the “Home Page” scroll down till you see the Radio Shows. Also, download the OSJ-app to listen in that way too. Act like you are going to send a text on your smartphone and in the “To” line type #95577 & in the “Message” type “50Plus” then Hit “Send” & you will get an immediate link to download the OSJ-app and listen to the OSJ Radio Show there anytime! Merry Christmas from Area Wide Aging Agency 2017. Hi Robin, Joan Clark (Santa’s Market Founder) said you needed the Santa’s Market flyer. Attached is an updated one. We are so fortunate to have such wonderful sponsor such as yourself and the Oklahoma Senior Journal and feel privileged to have the Oklahoma Senior Journal as a insert in our 1000 takeaway bags at the Santa Market on November the 18th this year! Thank you, Robin so very much !!! Thank you for helping us at the Alzheimer’s Association to raise awareness and funds by having me on the Rise & Thrive with the OSJ Radio Hour, The Oklahoma Senior Journal App, the OSJ Facebook page, OSJ e-newsletter weekly and on the OSJ website announcement page events list! We could Not do the Alzheimer’s Walk without partners like you and the Oklahoma Senior Journal’s media blitz and fundraising! Hi Robin . . . well I feel like a dunce! After asking you last week about advertising, I found your advertising page with LOTS of information! I’ve seen your magazine many times but just recently realized you were the brains behind it! What a great job you do with the magazine and with the public. I wish I had your mojo! Anyway, I think I can handle it from here. Thanks! Have a great week! Robin Gunn ~ Thank You for helping the Arthritis Foundation Market our events! I have seen what you have posted on the OSJ Magazine facebook page and the OSJ Magazine website “Announcement Page” myself. Thank you so much! We really appreciate you sharing our events. We also love Love LOVE the OSJ Magazine … What a great resource for the 50-Plus Community in Oklahoma! The Oklahoma Senior Journal is … A great resource for Seniors 50+ and also for sons and daughters and other family members helping their parents or loved ones navigate this time in life. Robin Gunn is great! Check out the Senior Journal. Robin, Thank you so much for referring Alicia and Scott Champion to me. I met with them Friday and thoroughly enjoyed my visit. They have a great business and are just the kind of people I like to work with. Once again, I really appreciate the referral and see you at our next meeting. – Larry Hughes CExP, M&AMI, The Hughes Group and Associates, Inc.
Hi My Name is Lydia and I live in a Senior housing community in Edmond Oklahoma. It was recommended to me to call Robin Gunn with the Oklahoma Senior Journal Magazine. I was having some issues that required some legal advice. A company I first called said you need to call Robin Gunn with the Oklahoma Senior Journal Magazine… She is a advocate for the 50-Plus in our city and the publisher of the Oklahoma Senior Journal. I called Ms. Gunn that very day 9/14/17 and she spent close to 1 hour with me on the phone listening to me and helping me get resources for my legal issues. Ms Gunn was so patient with me and spoke very slowly and clearly due to the fact I have a stock a few months back and could not go as fast as I use to in writing things down. Ms. Gunn was so kind and would wait for me to get each phone number and name down on my piece of paper. Ms. Gunn after we spoke also gave me additional information that I had not even realized I could qualify for. I told her how blessed I was for being able to have her as a guide to help me. Ms. Gunn even had a Oklahoma Senior Journal magazine brought out to my door step and provided copies for all the residences in our Senior community. Ms. Gunn – Thank God you care so much and have the resources and are welling to share those resources with me or anyone that calls you. Thank You Again, Grateful for You ! Thank you very much! I really appreciate all the support in you and the Oklahoma Senior Journal for the Sheriff Office, the article on the “Broken Jail House” and on TRIAD and The S.A.L.T. Council for Seniors in the current OSJ magazine issue!!! As well as the on air interview with me on the Rise & Thrive OSJ Radio Hour! Dear Ms. Gunn of the Oklahoma Senior Journal – I was wanting to know where I might pick up at a distribution sit in my area the Oklahoma Senior Journal Magazine? I think it’s a very valuable informative magazine for seniors and I want to get me a copy! Health Fair. We look forward to your presence. The Oklahoma Senior Journal and you are a must to any Oklahoma business. See you Wednesday. We at Synergy Home Care highly recommend the OSJ Magazine for all your marketing needs and exposure for your business to the Business Oklahoma Market!!! Thank you so much for all your help with the Hoedown. You were so kind in publishing the Alzheimer’s Hoedown Fundraiser on the OSJ-App, OSJ multiple Facebook posts, on the OSJ website “Announcement Page” and in 6 weeks of the OSJ e-newsletter! We all helped raise $2600 for the Walk to End Alzheimer’s last night. We, as a team at Canterbury, Thank You, Robin and the Oklahoma Senior Journal Media! Sincerely. Have a really great day. – Mary Shrum Administrations at Foundations at Canterbury Senior Living in North OKC. Robin – You are so Awesome!!!!! Thank you so much for all you do to help Fountains at Cantbury get the word out on our events for the 50-Plus! You and the Oklahoma Senior Journal are a true Blessing to Oklahoma!!!! Thank you for sharing the Salvation Army’s New Senior Grant money’s news OKlahoma Senior Journal! There is definitely a need and we are blessed to be able to help our seniors through this grant. God bless you, Oklahoma Senior Journal, The Salvation Army Appreciates You!!! Good Friday morning to you Robin, Thank you so much for helping us at the Salvation Army publicize our volunteer opportunity on the OSJ Facebook page, e-newsletter, app and website! The Oklahoma Senior Journal is a great friend to the Salvation Army! Good morning! You all are so kind at the Oklahoma Senior Journal I am a YMCA group instructor and in home instructor. I teach Seniors how to get in shape without hurting themselves and it is fun! So the convenience of my business is I travel to their homes. The Oklahoma Senior Journal Is Beautiful and Amazing! Thanks so much for promoting my classes for Seniors on the Oklahoma Senior Journal recurring events page, OSJ Magazine; E-Newsletter and OSJ Facebook page. Sincerely and Thank You! I just wanted to pass along some really wonderful health and wellness-focused resources for seniors. You already have such great information on your site on this topic (I love this pagel) that I thought you may like to share a few more, so you are absolutely welcome (and encouraged!) to add these to your site. The page I mentioned above might be a good fit – what do you think? Many thanks in advance! Thank you, Marie V.
In a Word Robin Gunn ….You are Amazing! Just a quick note to say ‘Thank You’ for the great information! I’ve looked through all the info you emailed me and with my schedule, should be able to make the OKC Women’s Business Breakfast in June and the Legacy Leaders event in July. Robin Truly…you are amazing! Thank you for always connecting services with the 50-Plus and Businesses as well!!! The Oklahoma Senior Journal is the best publication in our State for the 50-Plus and to have you as the guide behind the magazine is a blessing to the 50-Plus in our State, families and businesses! Thank you, Robin. We appreciate your support for the Oklahoma Arthritis Foundation. The Oklahoma Senior Journal and you are the best for getting the information out to our Seniors in Oklahoma for businesses and services in our city!!! Dear Robin, I just LOVE your e-newsletter and look forward to it!!!!!! I love all the info. that is in each OSJ Magazine e-newsletter, I count on it … It is the best !!!!!!! THANK YOU Robin Gunn for this info on Dementia Activities and Tools Link! <3 You are the bestest and so is the Oklahoma Senior Journal! SYNERGY Home Care LOVES working with you and your team at the OSJ Magazine! The Sixth Annual Senior Living Fair was a “success” even with the torrential rains and straight-line winds!! Most of the vendors were there and although we had a small attendee turnout we were successful in assisting three seniors with very specific concerns. Thank you Robin Gunn and the Oklahoma Senior Journal You always go above and beyond and for supporting The Salvation Army Senior Programs! The OSJ Magazine was stuffed in 1000 takeaway bags and handed out at the Senior Day at the State Capital on 4/11/17! Very special thanks to both of you Robin Gunn …You were SO important for the success of Senior Day at the State Capital this year for: Stand Up for our Seniors!!! Ms. Gunn – I would like to come pick up 40 to 50 Oklahoma Senior Journal Magazines for our Senior Group at our church, would that be possible? This magazine is without question the best resource in our state for local information for the 50-Plus age group. 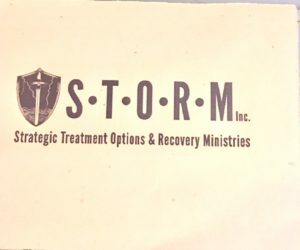 Editors Note: We gave out 50 to Mr. Starks Church! Hello – I live at Southern Plaza Senior Living in Bethany Oklahoma and myself along with a group of us that live here, would like to get some extra Oklahoma Senior Journal Magazines at Southern Plaza, would that be possible? We can not tell how much this magazine means to us here at Southern Plaza. I read it from cover to back cover and use the resources inside. We here and myself are so grateful the Oklahoma Senior Journal is published and so easy to get it in our hands! – G.Whistler at Southern Plaza Senior Living in Bethany, OK. Editors Note: We took fifty copies out to Southern Plaza the next day. I wanted to let everyone know what a great event ISS (Informed Senior Seminar) was. THANK YOU TO EVEYONE that braved the terrible weather. Attendance was amazing considering the weather conditions. We couldn’t believe how many seniors (200-plus) we had. All the speakers and vendors were there. It was a huge success. I had gotten a lot of positive feedback and they already want to know the date for next year’s event. The success is due to the panel and everyone being involved and helping get the word out about the event. You all did a great job and I am very proud of our committee. I look forward to working on the next ISS event. You are amazing and I feel so blessed to have you on the committee!! Editor’s Note : The Oklahoma Senior Journal has been on the board for the Informed Senior Seminar for 10 years volunteering our services. Thanks so much for all you do for NewView. Has been wonderful working with you-and marketing through The Oklahoma Senior Journal. Thank you Robin! I appreciate you thinking of us at Home Care Assistance. I’ve seen that film before “Alive Inside” on music with Dementia / Alzheimer’s patients. It’s very profound. We will take a look at the event and hopefully find ways to promote it. Thanks again for keeping us in-the-know! You and the OSJ Magazine are the best information out there in our state for the 50-PLUS and businesses that work with the 50-Plus and their families and the is probably every business! Hello Robin! We would like to continue receiving the OSJ here at the Senior Center. It sure seems like our peeps really enjoy the magazine and the rack is in a prominent place so it’s easily seen. I hope we have a chance to visit soon! OKLAHOMA Senior Journal – Testimonials from real readers, advertisers & acquaintances…. Thank you Oklahoma Senior Journal for helping us spread the news about the fan drive as well as how individuals in need can receive a fan. We appreciate you! Candace Meiler – Marketer for Belfair of Shawnee a Memory Care Community – Editor’s Note: The OSJ Magazine promoted Belfair’s Respite Care Special over the Holidays for only $99 a day for up to two weeks! I wanted to say “Thank You” for taking the time out of your day to meet with me this week! I enjoyed learning more about you and the Oklahoma Senior Journal. I am in awe of what all you know in the world of the 50-Plus in Oklahoma. The Oklahoma Senior Journal truly is “The Source” for Seniors and there Family’s. It is a plethora of valuable information of educational resources. If I can ever be of service to you or someone you know, please do not hesitate to call. Ms. Gunn – I am a retired Senior Male and I live in South OKC around 99th and S. Western Ave. I have a friend that has a Oklahoma Senior Journal and as I looked though the pages I realized, “I must have one of these Magazine’s”, Called: The Oklahoma Senior Journal. Is there a business or service I can pick up a copy of this very important resource guide for Seniors? I live in California and am planning on moving to OKC to be closer to family that live in the rural communities outside of OKC. My plans are to live in OKC but was unaware of the resources that are available to the 50-Plus. My family outside of OKC helped me a little bit but I still had a lot of questions, that needed to be answered. I began “goggling” information for Seniors in Oklahoma and the OSJ Magazine website came up plus the entire Oklahoma Senior Journal Magazine came up on-line too. I read all 86 pages right off my computer and my additional unanswered questions were answered!!! I love your publication, it is a fantastic resource and very helpful!!! Can you please also mail me a hard copy? Editors Note: I physically spoke with Mrs. Navarro and gave her several more directional informative services to look into before her move takes place and mailed her two hard copies. I AM Thankful to Ms. Gunn – Mrs. A. Navarro of Santa Maria, CA soon to be a new resident of OKC! Thank you Robin Gunn – Editor of the OSJ magazine for the kind words on the Oklahoma Senior Journal Facebook page. Our residents at Grand Tapestry’s 55-Plus Living enjoy your publication. We invite your readers of your wonderful publication the Oklahoma Senior Journal to stop by or give us a call to come see what the Grand Tapestry buzz is all about. Hello I live in Bartlesville Oklahoma and I come to Oklahoma City a few times a year and would like to have the Oklahoma Senior Journal as my road map … Thank You so much for providing this Magazine to the 50-Plus, it is so very needed and you do a wonderful Job on getting it into the hands of Seniors and their family members! “I wanted to thank you for taking the time to pass along your observations. It helps me since I can’t be at every event. Also, I wanted to let you know that I was recently shown how to add events to our website and I look forward to adding all of the fun and exciting ideas that we get to be a part of with you and because of you… I really appreciate all that you do for us and it’s always so much fun being around you! Again thank you so much and please don’t hesitate to reach out to me for anything! “– Anja Mottern, ARM | Community Manager Grand Tapestry at Quail Springs a Greystar Managed Community. I called Robin Gunn who is the publisher for the Oklahoma Senior Journal Magazine here in OKC and asked her to help me calculate miles on my computer from one place to the next, to keep track of for my taxes. Ms. Gunn got right on her computer and walked me through that process over the phone and then sent me the link to have for my personal file’s so I could use it myself whenever I needed to. Ms. Gunn and the Oklahoma Senior Journal have been a God Send to me and the VIP Senior Group I am the Administer for at Victory Church in OKC, OK. We always keep copies to hand out at our Senior Activity Groups. I am also the leader of the 110 year old Christian Woman’s Group at Quail Creek Golf and Country Club that meets once a month and we hand out the OSJ Magazine at least four lunch meetings a year that are attend by 70 to 80 woman. The OSJ Magazine has been a blessing to the 50-Plus in this Community for the last 21 years and I am so grateful that someone that truly cares to her bones and back for the 50-Plus, she really carers and will help out however she can or she finds the person or service that can!!! Hi Robin, I picked up a copy of your journal at Millie’s Table in Edmond a few days ago. What a great piece you and your team have put together! I just recently moved to town from Tulsa and am the Director of Sales and Marketing for Legend Memory Care. I have a true passion for helping seniors in difficult times. What a joy it is to see such a great resource for them! We are currently in the construction process for our brand new, state of the art Memory Care Community in SW OKC. I am very impressed by the ad you ran for Belfair in Shawnee. Is this something you normally do? How could Legend Memory Care be a part of this? I look forward to hearing from you. Thanks in advance for your help in us getting the word out! Robin, Just wanted to thank you for referring Norma Colvin to us. We can certainly help her find appropriate AL and in fact have some tours schedule with her and her family early next week. Hope you are doing well – we appreciate you thinking of us with Norma! Robin, Thank You for bringing to my attention that a couple of our Properties are having phone issues, we have been having issues with our roll over service. I will check into this. I really appreciate you and your attention to detail at the Oklahoma Senior Journal before you printed our information. I can’t believe you check the phone numbers and websites too in your proofing of the Magazine. Thank You Robin … what a great service your provide for the 50-Plus and for the business owner that is marketing with your company! That is Superb! Robin Gunn of the Oklahoma Senior Journal ~ You looked Good! That was a such good and informative piece on In Your Corner with Scott Hines from KFOR on the CareTrak demonstration which ran last night and today at noon on 10-2-15 & 10-3-15-15, Thank You for everything you have done to help bring CareTrak to the knowledge of the OKC Metro. The Voice and The Print to OKC are truly in the 50-Plus Corner of Oklahoma! Robin, Thank you so much for this information. It was really nice to see you and Eunice the other day. It was so refreshing visiting with the two of you. You both have so much knowledge and resources. Both of you are absolutely amazing and very passionate about senior care. Thank you again. “Robin, I went to the Oklahoma Senior Journal website to contact you about the drawing for the lawn vac and obtained your email address. I wanted to express my thanks to Oklahoma Senior Journal for this fantastic prize. I’m really going to enjoy using it. I’ll soon be 50 and will be a loyal reader of the Oklahoma Senior Journal. Thank you again.” –Deborah Lowe – Editor’s Note: Deborah was the Winner from the OSJ Magazine Facebook contest in the spring of 2015. “Robin: You did a really professional presentation yesterday at Business Builder’s Networking Group and I’m so glad you’re in our Club. The OSJ Magazine is an asset to the Oklahoma Community!” —Alan, Vice President / Financial Advisor, Southwest Securities, Inc.
“Good afternoon, I am the service coordinator at Wesley Village Retirement Community. I would like to know how we could receive about 40-50 of your journals for our center. I’ve picked them up at various locations in the past and I think they are great. I would love for the residents here to have access to all the resources and wonderful information in your guide. I could even come pick up some copies if possible. I look forward to hearing from you.” – Deborah King. Editors Note: Mrs. King came to the OSJ Office and pick -up her pack of 50 OSJ Magazines to give out to the Wesley Village Retirement Residents. “Hello My Name is Rodger R. and I have a past issue of the OSJ Magazine and I absolutely LOVE it!!!!! The last time I was at my doctor’s appointment in 2014 I picked a copy up and I have used and used this Magazine over and over … the countless resources in it are priceless! I have had some car issues and one of my little dogs is sick too so I was hoping I may have the current issue mailed to my house? I also am very grateful to the Pet Section dedicated to Animal Care … I just Love that too…. my two sweet doggies are my best friends and I am so thankful for the information that the OSJ Magazine has devoted with in it’s pages to my fur family’s care. Editor’s Note: I drove over to Mister Rouse’s home that day and personally delivered the current OSJ Magazine issue to him and his eyes lit up like Christmas tree lights and I got to meet his two little Pekingese Long Haired Pugs…. (his fur family as he calls them). This job is over the top rewarding…. I never just sit behind my desk … I am in the Senior Community everyday …. trying to make a difference for the last 21 years in the 50-Plus lives and those that serve, care and love them!!!!!! “My name is Jerry and I live in Oklahoma City and I have been recently home bound due to health issues and was hoping to have the current issue of the Oklahoma Senior Journal Magazine mailed to me. I use the on-line version a lot but would like to have a copy in hand too. I just LOVE the OSJ Magazine and I use it all the time. Thank you!” –Jerry B., OKC. Editor’s Note: We mailed out two OSJ Magazine to Mr. Biers the very next day. “Robin, We can take more Journals at the S. OKC library on 135th and S. Penn. We Love the Oklahoma Senior Journal here and run through them like water. Our patrons to the Library Love the OSJ Magazine …. We have had them here for two years now and always run out within 3 weeks of your drop-off’s monthly.” — Cylinda Richardson-Martin/Administration – OKC South Library Editor’s Note: Thee OSJ has now got the South Side Library now on an every 2 weeks distribution. We are finding this happening at more and more places in the OKC Metro … running out before the month ends. We are at a 100% to 95% pick-rate at out 550 OKC Metro Locations every single month!!!! Editor’s Note: I am not endorsing any “Candidate” BUT when a person asks how they can get involved with helping our Oklahoma 50-Plus …. I am listening! “Hello Robin. My parents moved to Shawnee at Primrose Retirement Community. I recently picked up a Oklahoma Senior Journal Magazine and was bowled over at all the 1,000’s of resources within its 68 pages. I can say that is by far THE BEST resources for Seniors and their families. Is it possible to get your journal delivered to my Parents at Primrose Active Adult and Assisted Living Community in Shawnee, OK?” — L. Pryor for J. & D. Hick’s / Shawnee, OK.
Editor’s Note: The OSJ Magazine mailed out 2 copies the very next day to the Hick’s and also made connections with the Office Manager (Jimmy and Rachel) at Primrose to deliver 100 copies to the Primrose Senior Retirement Community in Shawnee. OK.
Ms. Gunn, I have arrived at the age of 55 I spotted your Journal. I am in the process of familiarizing myself with it and I am impressed with the content and quality of you Magazine. I want to thank you for your service to this community. I also would like to ask if you would consider letting us help produce your Magazine. –Mark Dame, Southwestern Stationery, Inc.
— Pastor Paul Cwynar/ Holy Trinity Lutheran Church/ Edmond, OK.
EDITOR’S NOTE: The OSJ took 300+ OSJ magazines to Pastor Cwynar and set up the Holy Trinity Lutheran Church in Edmond as a regular distribution point. — Editor’s Note: The OSJ took 50 copies to the Church that very day. *Editor’s Note: The OSJ got an email out to Mr. Orza with in the hour and gave him 5 locations that his client’s could pick up the OSJ and we also offered to mail out copies to his clients. Mr. Orza opted to go pick up a few OSJ’s at one of our far NW locations and hand deliver to his clients. **Additional Editor’s Note: If you are using the OSJ as a regular resource for your clients it would be a very good Idea to market your services through the OSJ Magazine. You will then be part of our 550+ distribution points. Foot Doctor right in the Midwest City area that very day. Editors Note: Joe & Dixie Greene arrived at the OSJ offices the last Saturday in April and picked up over 300 OSJ Magazines. Sheryl Presley – Head of TRIAD at the OKC Police Dept. & Event Coordinator for the Informed Senior Seminar. Editors Note: The OSJ Mailed out two current copies to Mrs. McKey that same day! Westminster Presbyterian Church known as N.O.A.H. “Sharon Myers of N.W. OKC – Works Part time for “Senior Care Services” and she let us know that she personally uses the OSJ all the time in helping “Seniors” and their family member navigate the field of senior services out there in our State. She went on to let us know that the OSJ is the very “Best” resource out on the Market yesterday and today for Senior concerns, needs, issues and even discounts and entertainment! She went on to ask us to mail her a couple of new copies because she did not want to take any away from her work. Mrs. Myers herself is 64 and has relied on the OSJ for many years now. “Thank You, Robin Gunn and the OSJ for your detailed involvement of Information to our “Senior” population,” Mrs. Myers said. “The OSJ it is a “Must” have for “Seniors” and their family members”, Mrs. Myers went on to proclaim. Editors Note: The OSJ mailed out two current issues of the OSJ the very next day! EDITOR’S NOTE: The OSJ mailed her 2 copies the very next day. Editor’s note, The OSJ mailed 2 copies to Mr. Littlefield the very next day. “My name is Nancy Ritz and I am the director for the Yukon Mobile Meals. I picked up a copy of the OSJ at the Kimson Chinese Restaurant in Yukon and looked through it. It is the best source for “Senior” information I have ever seen! Yukon Mobile Meals is in the same building where I think you already deliver to the Yukon Senior Center. Can the Yukon Mobile Meals be a OSJ distribution point also? We would like to put the OSJ in with the meals we deliver to the “Seniors” homes in our area. Yukon Mobile Meals was also wondering if our information can be included in the next issue of the OSJ and we are on a very fixed budget. Thank You very much for your consideration.” — Nancy Ritz, Program Director, Yukon Mobile Meals. EDITOR’S NOTE: The OSJ has added Yukon Mobile Meals to our regular delivery schedule (and we took out a special early delivery that next day) The OSJ will be running the Yukon Mobile Meals Program listing for them in our next issue at no charge. “Hi Robin; I live near S.W. 59th and Portland Avenue and would love to know where I can pick up the latest issue of the Oklahoma Senior Journal in my area or you could mail me a couple of copies; here is my address. I have come to rely on all the many “Senior” related resources and would really like to have one or two of the latest issues. I really would appreciate it! Thank you.” — Lee Hallman – S.W. OKC. Editor’s Note: The OSJ mailed out two of the OSJ’s latest issues the next day. EDITOR’S NOTE: The OSJ mailed out our latest copy of the OSJ the next day to J.E. Starkey for Mr. Gary Starkey. “Hello! My name is Jackie Steele and I would like to get some extra issues of the Oklahoma Senior Journal. My friend has an issue and I have found it to be very informational. Could you please give me a call, I would love to have one for my own personal use and would love to give a few out to friends and family. Thank You for providing such an in-depth, informative, entertaining and educational “Senior” publication.” — Mrs. Jackie Steele of N.E. OKC, OK.
Editor’s Note: The OSJ personally mailed out several copies at no charge to Mrs. Steele the very next day and she was thankfully thrilled! mailed her out a FREE copy of the OSJ the very next day. Editor’s Note: We did deliver OSJ’s to them the same day. “I called the Editor (Robin Gunn) of the OSJ because my issue was a two-year-old copy that I have used many times for my ongoing needs as a “Senior.” I ask for the newest copy of the OSJ to be mailed to me because I am wheelchair bound and only get out by handicap bus. Ms. Gunn helped me with some needed phone numbers per our conversation and she mailed out a copy of the OSJ that very day. I am so grateful to Ms. Gunn and all the vast “Senior” information that is right at the reader’s finger tips through the OSJ! Santa (Douglas Jeffries) -Cottage Park Senior Living Editor’s Note: We did deliver OSJ to them right away. EDITOR’S NOTE: We mailed out 2 copies of the latest OSJ the next day! “I would like to know if there is a cost to have the Oklahoma Senior Journal distributed to our business. We are an Adult Day Health Care with a total of four centers in the Edmond/Metro Oklahoma City area. EDITOR’S NOTE: the OSJ did deliver to the Centers at zero cost to them. I apologize that it has taken me so long to respond. Thank you so much for posting our seminar for the Alzheimer’s Association Community Resource Event. You are very kind in helping us market! If you would like to bring a few senior journals by the office anytime on Wednesday, you are more than welcome to do so. We are expecting up to 30 attendees so even 50 would work incase someone has a loved one that want to pass a copy of the Oklahoma Senior Journal on to. The OSJ Magazine is such a vital resource guide for the 50-Plus and their family members! Thank you again Robin for your generosity. Robin, Please hold the space for the Village on the Park …WE WANT IT! Thanks for all you do…you are so awesome! Have a great week!! “Seniors are some of my most favorite people in the world and why I do what I do. I have seen first-hand great loneliness and pure lack of attention that can ensue for Seniors, when those of us do not take a “Stand for Seniors” and their growing needs. Heck, we will all be there and be a caregiver at some point in our life. Aging Is NOT for SISSIES!!! EDITOR’S NOTE: We did provide the OSJ copies to her at no charge, even though they are not currently an advertiser. It’s a great publication and we can not wait to begin working with you and The OSJ. Thanks. “As a Senior Real Estate Specialist, The Oklahoma Senior Journal has been an important part of my business – always my best advertising dollars. Robin and the OSJ have been my greatest networking resource, always going the extra mile to keep me informed and in touch. Amber Bergerson, Sr. Rep. at S.T. “I have been an RN for 11 years and I am currently working at Northwest Surgical Hospital. Northwest Surgical is one of OSJ’s distribution points. On many occasions I have referred patients and their family members to the OSJ as a resource for their senior needs. The OSJ is the most complete and informative guide for seniors and their caregivers that I have found. I highly recommend the OSJ for all seniors. We can hardly keep them in the hospital which speaks volumes about the publication! Journal. People let us know they read the article and are excited about our services. We would highly recommend the Senior Journal.” –John P. Belardo, M.D. We’re seeing a huge interest in the Oklahoma Senior Journal at the hundreds of locations here in the Oklahoma City metro area to which we deliver. Of the thousands of journals we deliver each month, we have had a consistent pick-up rate of about 95%. It’s very satisfying to distribute a publication that so many seniors are benefiting from!